A DELUXE FULLY SCRIPTED MURDER MYSTERY PARTY GAME FOR EIGHT PLAYERS (AND UNLIMITED AUDIENCE MEMBERS)! 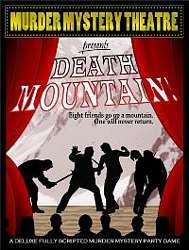 Deadly theatrical fun for 8 players! St. Algernon’s Hospital is home to eight of the world’s most brilliant doctors. So when the hospital board announces they’re looking for a new Chief of Medicine, competition quickly hots up. Before the week is out, a doctor will be dead – murdered by one of their esteemed colleagues. But who will be killed...and who will do the killing? Invite your friends, act out the unfolding drama, and compete to solve the crime! DR DRAKE LIVINGSTON - The world’s foremost expert on rare tropical diseases and a keen explorer. DR SALLY FREUD - An insightful and controversial psychiatrist, with a string of published self-help manuals. DR ADAM SPOCK - A specialist in paediatrics and child diseases, with 17 children of his own. DR HELENA JEKYLL - A top-secret medical researcher and infamous recluse. DR BERNARD BARNARD - A world-renowned heart transplant surgeon and notorious ladies man. DR MARIA CURA - A groundbreaking geneticist and amateur sheep breeder. DR PHILIP BONES - An acclaimed orthopaedic surgeon and enthusiastic amateur stuntman. DR ELIZABETH KASPAROV - A brilliant neurosurgeon and an accomplished chess master. - Complete instructions for hosting the perfect party, including recipe suggestions! WHAT IS MURDER MYSTERY THEATRE? From the creators of the best-selling boxed games, Murder Mystery Theatre gives you and your guests the chance to act in a thrilling murder mystery in your own home! The bigger the performance, the greater the fun! With a script packed full of danger, intrigue and unexpected twists – plus suggestions for costumes, sets and props – Murder Mystery Theatre provides everything you need for a truly dramatic night in! Murder Mystery Theatre is a sophisticated murder mystery party game for players aged 12 to adult. The fully developed storyline encourages players to get more involved in the mystery, and with no “main” character or obvious victim, any one of the players could kill or be killed, increasing suspense throughout the course of the evening. The plot is peppered with red herrings and unexpected twists to keep even the sharpest amateur detectives guessing! With an emphasis on spontaneity and performance, Murder Mystery Theatre encourages you to take your role-playing to a whole new level. Awards are provided for the Best Actor, Best Actress, Best Dressed Artiste, Most Lines Fumbled, Most Imaginative Use of Props, Player Who Took the Game Most Seriously, Player Who Took the Game Least Seriously, and Keenest Detective Mind. The host can even videotape the entire show! Murder Mystery Theatre can also be used for large parties. Just enlist eight actors to perform the mystery, while the rest of your guests play detective from the audience. Print additional guest programmes and include them in the final round of accusations! The host sends out invitations and costume suggestions, provides simple props (e.g. a whisky glass, an umbrella) and creates basic makeshift sets (e.g. a restaurant table, a park bench) as described in the Programme. Then players arrive in costume and Act One begins. Each Act contains a number of different evidence revealing scenes. Up to four players act in each scene using the scripts provided whilst the remaining players make up the audience. During Act One, one of the characters is murdered by an unknown killer. But don't worry that the show's over! After their memorable death scene, that player returns in flashback scenes to reveal crucial evidence. There is an ‘intermission’ between each Act, allowing food and drinks to be served and players to discuss ‘the story so far’. At the end of Act Three, each player announces who they think is the murderer then the victim reads out the solution. The game finishes with the host presenting awards. We think Download For Murder games are better than other download games! Why? 1-Your email contains links to a website where you can email your invitations! 2-The same website has extra downloadable files to complement your game! 3-They're created by the people who write the boxed games. The license entitles to you make as many copies of downloadable materials as you wish for personal use but business use is excluded. You may not replicate or sell, in part or in whole, any downloaded content from this website without express written permission from the copyright holders.